What is 3D Digital Sculpting? 3D sculpting(also called digital sculpting) is when an artist sculpts a 3D object on a computer with material similar to digitized clay. Software with brushes and tools that push, pull, pinch and smooth make it easy to create detailed sculpts that mimic real life textures and objects. There are multiple programs that allow artists to sculpt creations from either a base model or from scratch. 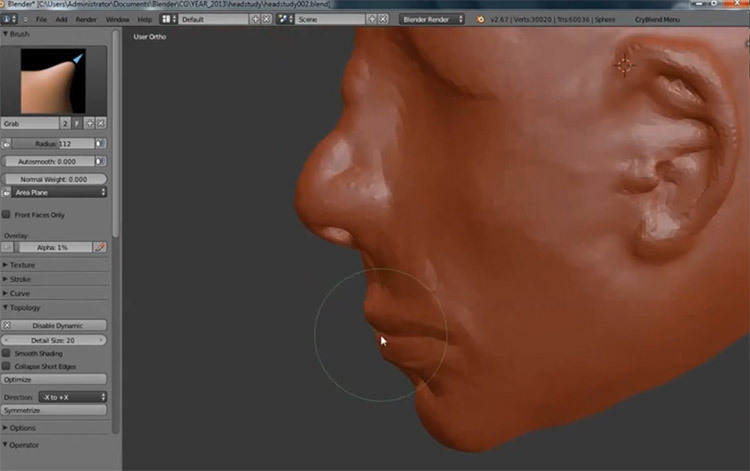 They use complicated calculations to create detailed polygon meshes that act like real clay. An artist will begin with wide, broad manipulations—much like a traditional sculptor—and then move onto more detailed work by increasing the polygon count. A digital sculptor can take anywhere from 30 minutes to hundreds of hours on a project. The time spent sculpting depends on the complexity of the project and skill of the artist. How Does Digital Sculpting Work? Much like sculpting with real clay, digital sculpting is a multi-layer process. Artists can start with a basic model completed in a 3D modeling application, or with a simple shape like a sphere. They start the process by using tools that manipulate the geometry of the sculpt. These tools can push, pull, and twist the geometry. You can even add on extra geometry if needed. The first layer will define basic features like the shape of a nose or curve of a tricep. This step is called blocking. Once the artist is happy with the basic shape and silhouette they will subdivide the geometry to add more detail. Digital sculpting uses a lot of computer resources and requires significant processing power. With each subdivision the project will get slower and slower as the processing needs compound. This is why the blocking process working layer-by-layer is crucial. Continuing with the following subdivision layers, a digital sculptor will then add more and more details over time. In this step small imperfections like scars or pimples can be added to characters that make the 3D sculpt look more realistic. On the last subdivision—the layer with the most detail—the artist will add minor texture detail like pores. Much like a clay sculptor will use material such as dried leaves or cotton scraps to create texture. A digital sculptor can customize the texture of the brush they are using to suit their needs. These fine textures are used to create detailed, realistic surfaces that add to the realism of the final sculpt. Digital sculpts are used in films and TV shows that rely heavily on visual effects or 3D animation. A digital sculptor is needed at various points in the creative process too. In the conception phase a sculptor reworks concept drawings into 3D sculpts. This helps the director get a sense of the character and make changes before locking down a look and feel. Once the concept is finalized a digital sculptor will be given a model to detail. This step is vital in creating realistic 3D environments and characters. The sculpt texture will be applied to the final model and rendered for a realistic result. This is one factor in making digital creatures look real. Sculpting is also used in high end game design. Most game objects need to be optimized to have the least polygons possible to reduce the total size of the game through compression. By using a texture map from a digital sculpt, game designers can keep the polygon count low while cramming in as much detail as possible. Modeling vs Sculpting: What’s the Difference? 3D modeling is the backbone of all 3D applications. You create and manipulate an object using polygons(quadrangles or triangles). These are mathematical calculations inside the program. You cannot shape models organically like this. Instead you use shapes, lines, and vector points to create a 3D model. Modeling is geometric in nature and is perfect for creating an angled object, like a chair. Because you are in deliberate control of each polygon the mesh maintains its integrity and there are no extra steps needed to topologize it. 3D sculpting is a more of an organic process. By using brush-like tools a sculptor can manipulate the polygonal mesh of any object. The tools are soft in nature for softer work. And although making hard, angled objects(like a chair) is not impossible, it takes far more time than modeling. It’s best to use sculpting for organic objects like characters or trees trunks. Sculpting allows the artist to reach incredible levels of detail in the texture of the subject. Because the mesh is complex, sculpts need a retopologization before use in another program. In recent years this process has become more and more automated so it’s easier for beginners to break in. 3D modeling and sculpting go hand in hand. If the creation is being used for animation it will be modeled first. The model will be sent to a sculptor for detailing while an animator then animates using a basic, low-res model. At the end of this process the sculpt will be layered over the animation and rendered. This achieves the final look with the least amount of computing power. 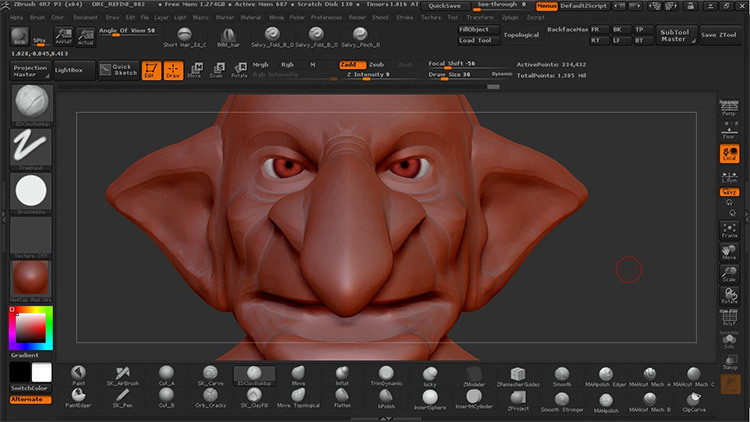 The most popular and widely used sculpting software is ZBrush. Because of its intuitive toolset and easy integration with the 3D software it is a favorite across the 3D industry. Mudbox is a close competitor and is more popular with beginners. The learning curve is gentler than ZBrush but it does not offer the same brushes and toolset. And Mudbox play well with other Autodesk software like Maya and 3DsMax. 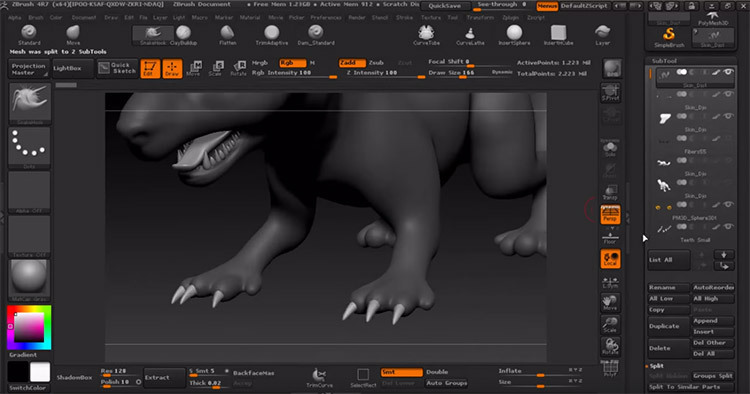 The company behind ZBrush created a free sculpting program called Sculptris. It’s super intuitive and easy to use, even for a beginner with no 3D experience. The toolset is basic so once you reach a certain level you’ll want to think about upgrading to a more complex program. But there are plenty of choices to pick from. 3D sculpting is the perfect medium for 3D artists to get more creative with their work. 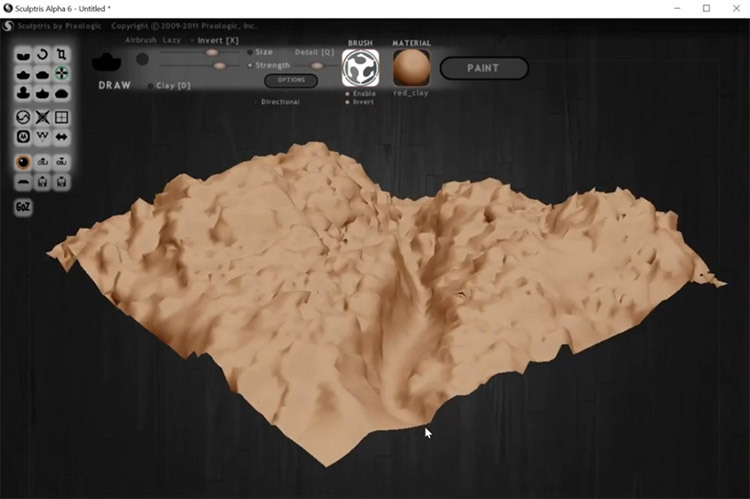 Much like a traditional sculptor, a skilled digital sculptor can use brush-based tools to manipulate digital geometry(basically fake clay) that mimics organic structures. Any good sculpting program will let you do that. And by using these techniques it’s possible to reach incredible levels of detail that would be impossible with 3D modeling alone. Claire is a traveling creative living in Osaka, Japan. She spends her days writing things, learning things and eating ungodly amounts of sushi. Read about her adventures here or secretly stalk her on Instagram and Twitter. What is 3D Modeling & What’s It Used For? What is a Polygon Mesh?